The South Carolina Archaeology Public Outreach Division (SCAPOD) was formed in 2010 with a mission to engage the public in the presentation and preservation of the regions cultural heritage through publications, education and museums. With an explicitly ‘think local’ perspective the recently formed 501(c)3 is an example of how local initiatives can be instrumental in bringing the often exotic perceptions of archaeological research into our own backyards. 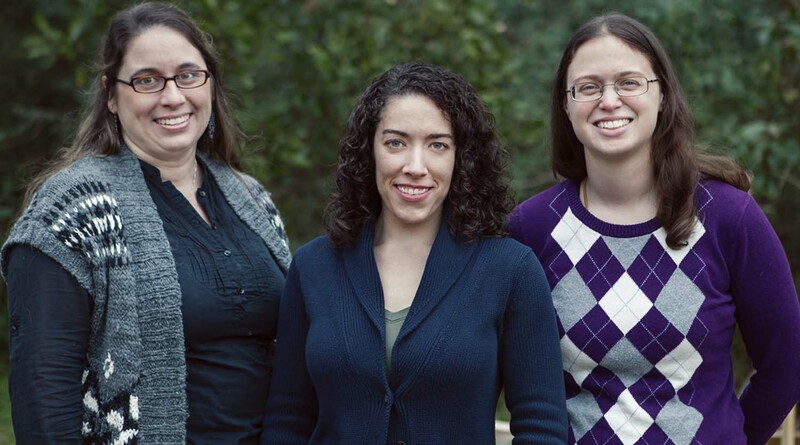 The three SCAPOD co-founders, Helena Ferguson, Meg Gaillard, and Erika Shofner demonstrate the commitment to public service in archaeology by the new generation of practitioners. Below is an interview with the three co-founding members of SCAPOD. Can you tell me a bit about SCAPOD, how and why the organization was formed? In 2008, Meg and Erika were looking for a topic to present at the upcoming Southeastern Archaeology Conference (SEAC). Both were interested in educational outreach in archaeology and heard about the South Carolina archaeology teacher’s manual “Can you Dig it?” that was compiled in the 1980s. They decided to examine the manual along with the current archaeology outreach in South Carolina and find a way to update the lesson plans to fit current standards. The more they researched the more wonderful outreach programs they found (both past and present). They outlined a possible plan for updating and maintaining a new archaeology manual for South Carolina teachers at the conference. A number of professionals expressed interest in what they proposed. Helena soon joined the group and the three started coming up with more archaeology public outreach ideas and projects. It was clear that there was no single organization that dealt primarily with archaeology outreach in South Carolina, so Erika, Meg, and Helena decided to make their own. What niche does SCAPOD fill in educational outreach in South Carolina? We do a little bit of everything – classroom visits, adult programs/presentations, museum exhibit design, and so forth. We have plans of more projects for the future. However, one of our main visions for SCAPOD was for it to be an archaeology outreach “clearinghouse” of sorts. 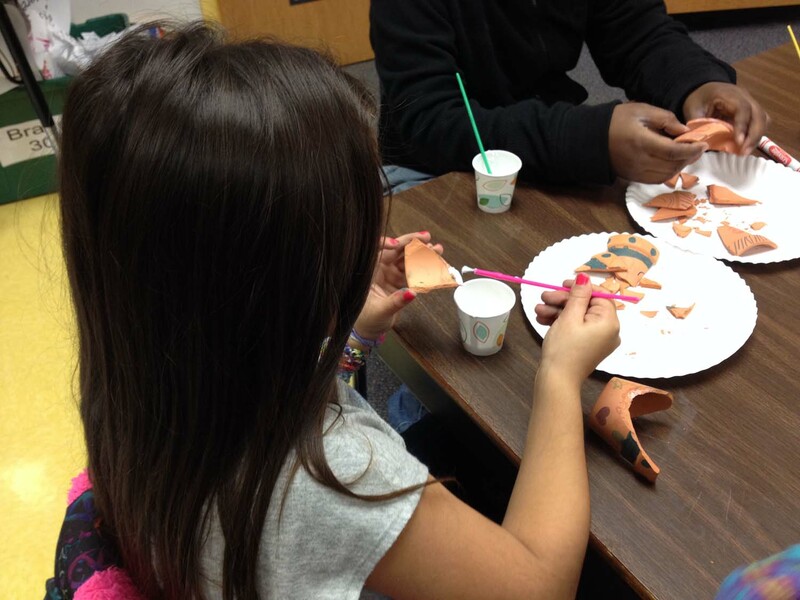 There are numerous other organizations that do great archaeology outreach programs. We don’t want to be seen as competition for organizations who do similar programs to SCAPOD, but rather a collaborator that can assist in successful archaeology outreach within South Carolina. We also aim to fill in the gaps of needed programing statewide. In your outreach efforts you promote a “think local” perspective. Has that approach been successful? We like to think so. Often, we find that when we talk to people about archaeology, they begin to talk about far off lands like Egypt and Greece. Although archaeology in these areas is widely publicized, people have a hard time making personal connections with far off lands. Discovering and learning more about the archaeology that goes on in South Carolina, sometimes literally in their backyards, makes the topic much more relevant to people especially children. Children are total cultural creatures, meaning they are sponges of the culture that surrounds them. Exposure to thinking culturally on a local level is a tremendous benefit to them as they grow and develop. We have been in contact with teachers about archaeology program development. They were very excited to hear we emphasize South Carolina’s history and archaeology. In local schools, when they focus on South Carolina history, our archaeology programs fit nicely into the curriculum while also meeting state teaching standards. 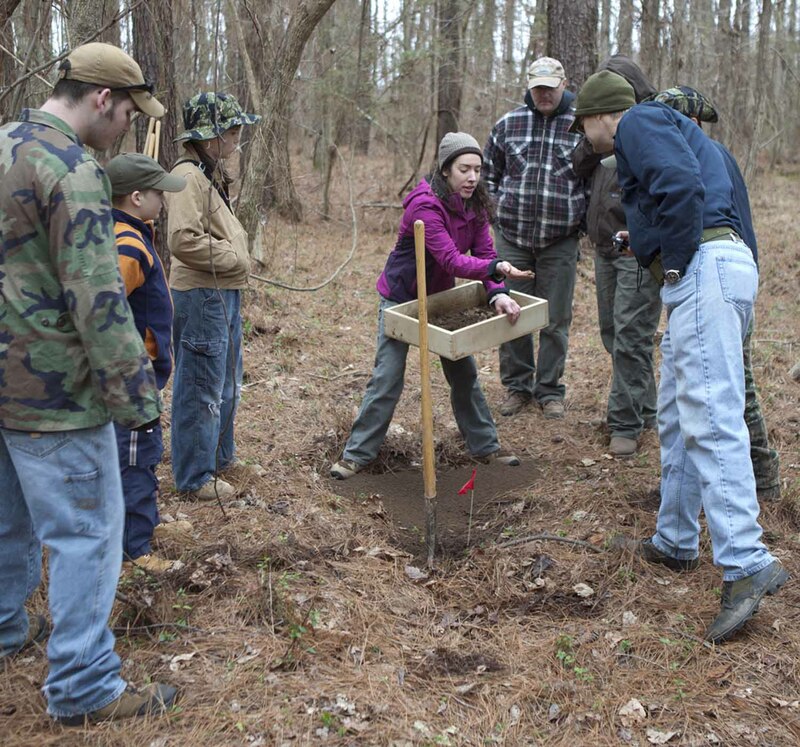 SCAPOD co-founder Meg Gaillard teaches Boy Scouts and Scout leaders how to shovel test, screen dirt, and look for artifacts at the Fort Congaree Site. SCAPOD helped these Scouts earn their Archaeology Merit Badges. How has your public outreach evolved since SCAPOD was formed? We have learned to be flexible with our approaches and programs. We found giving multiple program options, or offering to tweak a program so it fits the setting/current area of study works the best, rather than having set or “canned” program options. It seems best if you allow the client/audience to guide some of the development of the programs so that we can effectively reach the public. Our outreach is a unique form of applied anthropology, where we take anthropological perspectives and make them relevant through real life examples of archaeology. We have also learned four very important words “go with the flow”. No matter how well you think you have something planned, there is always the potential for something unexpected and opportunities for creative development. How will SCAPOD adapt programming to meet common core curriculum standards? The manual that began this whole adventure, “Can You Dig It”, was a printed manual handed out to teachers. Our draft third grade manual is currently available and completely free on our website (scapod.org/manual). Our plans for the manual are to keep adding grades to it on the digital format. Having the manual in digital format allows us to edit in order to fit the changing nature of the South Carolina teaching standards in real time. The cost associated with editing, printing, and distributing is eliminated which allows us to keep the resource free to teachers. All SCAPOD Archaeology in the Classroom programs have a connection to the current South Carolina teaching standards, and are revised as those standards change. We just completed activities from a grant that was awarded to us by Target Corporation for our Archaeology in the Classroom program. This grant allowed us to provide students with quality archaeology programs and helped teachers reinforce their lessons. The students reached with this program go to schools where budgets have been slashed preventing them from being able to take field trips and have access to supplemental educational opportunities in the classroom. Our hands-on programs brought the material to them for free. How has SCAPOD incorporated social media and a “virtual” presence in public outreach and education? We have a SCAPOD Facebook, Twitter, and Pinterest page, as well as our website and associated blog. As SCAPOD develops, we have found that social media has been wonderful for publicizing what we do and where we have been, as well as local, national, and international stories of archaeological interest. One thing we have learned is how difficult it can be to keep up with social media posts! We are always looking for volunteers to help us keep our virtual presence active and up-to-date. As a relatively new organization, what are some of the biggest lessons you have learned from your educational and outreach program? You can never have too much help! We have begun to rely heavily on volunteers to help us carry out our programming. We are very fortunate to have great volunteers that make this possible. Our connections with the local archaeology community provide us with dedicated individuals. Also, experiment! We have learned, because of the custom tailored nature of our activities, we really don’t know how a program will go until we do it. Every time we do a program we have a list of how to improve it and what worked well. The list helps us the next time we go to do the program. If you’re afraid to try something that’s never been done before, you’ll never get new and original program ideas. Time is our biggest obstacle right now. All three of us have full-time jobs outside of SCAPOD, so it can be a challenge to balance work with the development and execution of our programming. Thankfully we are all creative thinkers and do well with unique schedule adjustments. We have been fortunate in the past year to begin developing a dedicated group of volunteers. With SCAPOD’s current growth, we would not be able to do the amount of programming we have without them. What has been your experience working with Boy Scouts in earning the Archaeology Merit Badge? Working with the Boy Scouts in helping them earn their Archaeology Merit badges is a relatively new endeavor for SCAPOD. The requirements and guidelines for the merit badge are quite rigorous and, require professional assistance or supervision. Although it is possible to complete the badge without direct access to artifacts or archaeological sites, we feel that hands-on experiences with archaeologists are the best way for the Scouts to get a true understanding of what the badge (and archaeology) really mean. We were fortunate to have the opportunity to collaborate with a State Park Service Ranger who previously worked in Florida doing archaeology outreach activities. When he came to South Carolina, he already had a good framework in place on how to fulfill the merit badge requirements using resources available through the State Parks. SCAPOD has used this framework in conjunction with our own archaeological programming to provide a hands-on experience in the field. Pairing South Carolina Boy Scout Troops with nearby archaeological sites is another way we are able to implement our “think local” theme and give the Scouts the opportunity to work at an actual site. Love what you do and don’t be afraid to try something new and take a risk! If you love it then the amount of time you put into it unpaid won’t be as painful. The formation of SCAPOD was a risk. There was no roadmap for what we did. We have put an enormous amount of our own time into what we have accomplished, but we love what we do. We love working with the public and seeing them light up when they make the connections our programs provide. That professional passion and those we work with is what has made us a successful nonprofit organization. Being driven by what we do and the need we fill is what is propelling the organization forward. We look forward to seeing what the future holds for SCAPOD! Love to hear about other organizations promoting archaeological resources! Way to go SCAPOD!